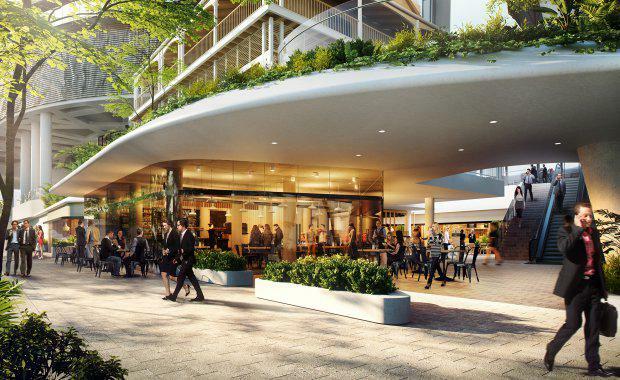 Brisbane-based developer Anthony John Group has unveiled retail precinct plans for its $600 million mixed-use development at Southbank which is set to be delivered in time for the completion of Flight Centre’s global headquarters in mid-2016. A total of 4,500 sqm will be offered over two levels at the Southpoint development, including a mixture of fresh food, dining and boutique retail options, catering to South Bank’s rapidly increasing worker, resident, visitor and commuter segments. awarded Property Council of Australia’s Queensland Retail Property of the Year Award in both 2014 and 2015,” Mr Bulloch said. He said the planned retail was aligned to South Bank Corporation’s vision for the site, creating a village-style market atmosphere that serviced the needs of immediate traffic generated by commuters, workers, students and residents. “On top of the extremely robust traffic figures South Bank currently boasts, Southpoint is set to inject over 2,500 workers to the area," Mr Bulloch said. "Flight Centre’s new global headquarters will see a portion of its business open 24/7 to support its ever expanding international client base, and over 1,000 new residents will reside on completion of the Emporium Residences, Emporium Apartments and The Apartments in 2017. "Then of course there is also the 142 suites in the new Emporium Hotel. refurbished and used again as it was during World Expo 88 as a destination restaurant. South Bank train station, with approximately 60,000 commuters boarding and alighting each week, is also set to receive a $5m facelift, including a new railway entry, travellators, ticket office, toilets, platform upgrades and platform awnings.